The Smart Lunar R2 is a small (AAA) rear LED in the clip-on tradition. It benefits from superior construction quality relative to the infamous Smart Superflash 0.5W LED light, but at greater cost. Currently Wiggle have it on a 10% discount, while Chain-Reaction are doing a respectable 20% off. I’ve been commuting using dynamo lights for some time now, but my better half has made do with a few different battery rear LEDs since we own so many rear lights of various ages! The Smart Lunar R2 has a clip on the rear which allows you to attach it to items of clothing, bags, and so on. It is also supplied with a seatpost and seat stay mount that secures the light using the same clip. Rather than a nice jubilee-clip style mount, the Smart has a more primitive fixed-size band, tightened by a small metal screw. Say hello to packing out the mount with tape if it’s not just the right size, and don’t strip that screw head! It’s rare to see people riding with a light attached to bag or body that’s actually pointing in the right direction. I’ve tried this myself often… either the light points to the sky or ground or it waggles around spraying photons like a garden sprinkler! The ability to mount on the seat stays means you should be able to find somewhere for the Smart Lunar R2, even if you have a short seatpost or use a seat bag. Don’t worry that the spokes will obscure the light from drivers on an inside lane – in reality they’ll have spent plenty of time being lasered getting into that position. The R2 is extremely bright – so bright that it’s unpleasant to ride or drive behind someone using it, especially in flash mode. While this may be great in some circumstances, making it unpleasant for people to drive behind you can definitely encourage them to overtake. As a driver, I can vouch that sitting at light behind someone with a mega LED flasher definitely focuses my mind on getting past! It’s important to mount the light completely level, as designers depend on this when working out off-angle visibility and other factors. Do not point it at the ground in lieu of just buying a less dazzling light! That said, you can safely ignore anyone who says flashing lights aren’t road legal – this hasn’t been the case for about a decade. Because the Smart Lunar R2 hasn’t passed the relevant tests it isn’t road legal when used on its own (in any mode). I’ll write more about this separately, but unless you go for a dynamo (all dynamo lights are genuinely road legal), it’s true of pretty much anything a bike shop will sell you. The Smart Lunar R2 has a small end-on button that isn’t the easiest to operate. It works more like “press in part of the body” than the distinct, super-positive rubber button you’ll find on many Cateye and Raleigh RSP lights. That said, it’s not rocket science to turn it on at the start of your ride and off at the end – just a bit of hassle if you want to change modes on the way, especially gloved up. It has a simple “press for next mode” (including the “off mode”) which makes it straightforward to change on the fly whilst riding. The large number of modes makes it slightly more tricky to switch off as you need to count just the right number of clicks. I bought two Lunar R2 lights from my LBS around two and a half years ago. One of them failed (bounced off on a pothole and run over) but the other is going strong. The Smart Lunar R2 runs on two AAA batteries. We get around the stated battery life (50 hours flashing, 25 hours solid). Remember that the temperature at which you use the light and the type of battery used both influence that figure. 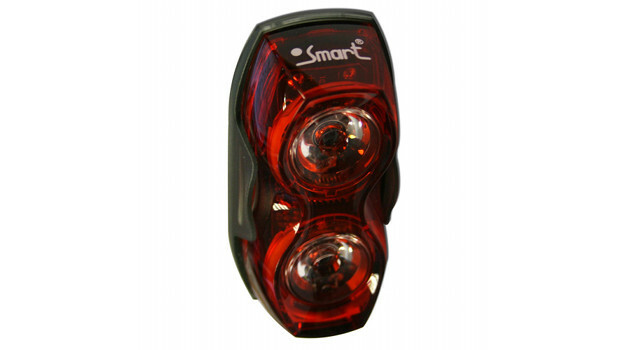 With rear LED lights it’s important to bear in mind that brightness and battery life are a direct trade-off. Almost all are manufactured using essentially the same mature technology and LEDs which are broadly equal in efficiency. All you need to decide is whether you’d like twice as many photons for half as much battery life, or vice-versa. The Smart Lunar R2 produces quite a lot of light and so is fairly battery-hungry. If you know battery life, you can work out the true power draw of your light using simple mathematics. A genuine 0.5W LED current draw would give a battery life of just six hours on AAA. Two 0.5W LEDs would last just three hours! The Smart Lunar R2 is reasonably sealed, given that it’s lasted three winters. The internet is less sure, with quite a few reports of water ingress. While I agree that the sealing could be better, we’ve never had a problem with our lights in pretty foul weather (although we do use mudguards). The Smart Lunar R2 2×0.5W rear LED light is a solid effort – it’s much better built than the cheaper Smart Superflash 0.5W LED, although perhaps not as well built as some competitors (especially the mount, which is competent but not outstanding). Again, Wiggle currently have it on a 10% discount, while Chain-Reaction are doing a respectable 20% off. I bought this light today cycled 15 miles home in light rain to discover I couldn’t turn it off due to water damage. Sounds poor, especially considering my wife’s R2 did at least a couple of years on the commuter riding right through the winter… I guess that’s the easy thing about buying from a shop – just take it back for a swap (or refund)!